If you have any questions about the GALILEO information page below please contact us. GALILEO was previously called project/yacht name Aegean 164 G. This 50 m (164 foot) luxury yacht was made by Aegean Yacht Services in 2007. 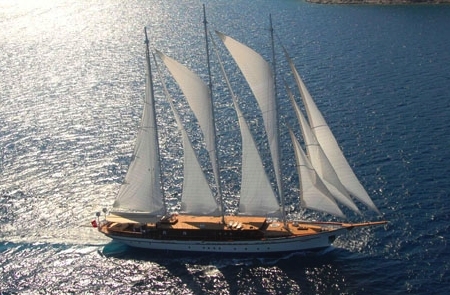 Sailing Yacht GALILEO is a noteworthy superyacht. The naval architect which delivered this yacht's design work in respect of the yacht is Aegean Yacht. The interior design work is the work of the talented Yavuz Osman Mete. Aegean Yacht was the naval architect firm involved in the technical nautical composition for GALILEO. Also the company Aegean Yacht successfully worked on this project. Interior designer Yavuz Osman Mete was responsible for the internal internal ambience. 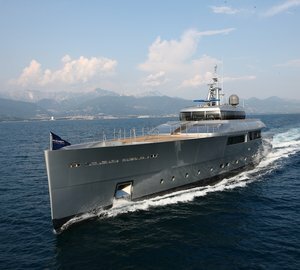 In 2007 she was actually launched with celebration in Bodrum and post sea trials and finishing touches was afterwards delivered to the owner. Aegean Yacht Services completed their new build sailing yacht in Turkey. Her core hull was built out of steel. The sailing yacht main superstructure is fabricated for the most part with steel. With a width of 10 metres or 32.8 feet GALILEO has spacious size. She has a fairly deep draught of 3.6m (11.8ft). Connected to her MAN engine(s) are twin screw propellers. The engine of the ship produces 760 horse power (or 567 kilowatts). She is fitted with 2 engines. The combined output for the yacht is accordingly 1300 HP / 1134 KW. Bestowing volume for a limit of 11 welcome guests sleeping aboard, the GALILEO accommodates everyone comfortably. Main Engine(s) is two 760 Horse Power or 567 kW MAN. Total engine power output 1300 HP /1134 KW. On Sept 2009 GALILEO cruised Bodrum, in Turkey. GALILEO has cruised the area including Mu?la Province during Sept 2009. The luxury yacht GALILEO displayed on this page is merely informational and she is not necessarily available for yacht charter or for sale, nor is she represented or marketed in anyway by CharterWorld. This web page and the superyacht information contained herein is not contractual. All yacht specifications and informations are displayed in good faith but CharterWorld does not warrant or assume any legal liability or responsibility for the current accuracy, completeness, validity, or usefulness of any superyacht information and/or images displayed. All boat information is subject to change without prior notice and may not be current.